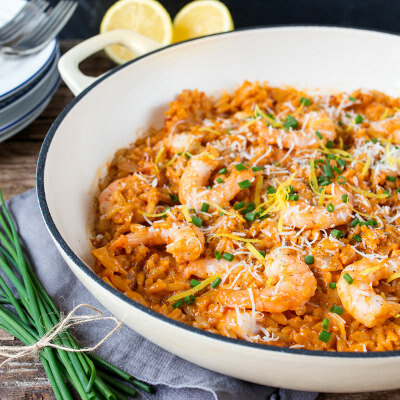 A mouth-watering, creamy orzo pasta topped with succulent king prawns cooked in V8 Original juice. 160g (approx. 20-25) king prawns. These can be ready-cooked, or raw, deveined prawns. Heat the oil in a large frying pan on a medium heat. Add in the onion and cook for 5 minutes – until softened. Stir in the garlic and then add in the orzo, stirring to coat in the oil. Pour in the stock, V8 Original and tomato puree. Bring to a gentle simmer and continue to cook (stirring often to prevent sticking) for 10-12 minutes. At this point, most of the liquid should have been absorbed and the orzo should be al-dente. Add the king prawns, and heat through for 2 minutes – until the prawns are cooked through. Stir in the cream, half of the parmesan and the lemon juice. Cook for a further minute, then turn off the heat. Serve topped with the remaining parmesan, lemon zest, freshly ground black pepper and chives.